New car to me, few oddities - not starting immediately, lumpy idle and slight miss on hard acceleration. Thread: New car to me, few oddities - not starting immediately, lumpy idle and slight miss on hard acceleration. Due to the snow my A6 unfortunately died, so I now have an A4 B7 2.0Tdi sline 170. As im new to these engines I need a bit of help working out what is normal and what isnt. I had to buy in a bit of a hurry, but the car seems pretty sound, however there are a couple of things which im not so sure about. In order of when they appear, i have the following things happening. In the morning or at the end of a working day when I start the car it doesnt start immediately - it requires turning over a few times before it goes. When it is going the idle "seems" a bit lumpy - although being used to the V6tdi i dont know if the 2.0 is just a bit like that - its idling around 780rpm. It also seems that occasionally when you boot it from low revs it just stutters a bit - almost like its missing, but then when the revs pick up its fine. I have had vcds on it, and there are no DTC's logged - ive looked at the injector readings and the all seem within the tolerance - all hovered around -0.5 to +0.5. I have contacted Audi, and they say it has no outstanding recalls on it - so I must assume the injector recalls on this model have been done if needed. Ive run injector cleaner through, and also re-oiled and cleaned the K&N panel filter it came with. Its doing around 40mpg on a run and 34 around town? Any ideas where to look to see what might be causing the above oddities? I have vcds, but am not particularly experienced in using it other than resetting faults and now looking at the injector values! The other small thing is that 2nd gear isnt directly down from first, is that normal? It seems a bit annoying because if I am changing from 1st to 2nd quickly i often get caught because I have to just slightly pull down and to the right to get second - again I dont know if that is normal and if not how I go about fixing it? Re: New car to me, few oddities - not starting immediately, lumpy idle and slight miss on hard acceleration. Is there anyway of diagnosing that using vcds? Tried the disconnect maf sensor trick and the engine seemed a lot smoother so plumped for a new maf, installed tonight and will see if it has sorted things tomorrow! Any thoughts on second gear? Is your car 6 speed manual front wheel drive? did the maf work and were did you get it from ? l Gear selector linkage must be in proper condition and undamaged. l Selector mechanism must move freely. l Gearbox, clutch and clutch mechanism must be in proper condition. – Remove gear knob together with boot → Chapter. – Remove operating and display unit for air conditioner → Rep. Gr.87. – First lift trim panel -1- in direction of -arrow A-, then pull it out in direction of -arrow B-. 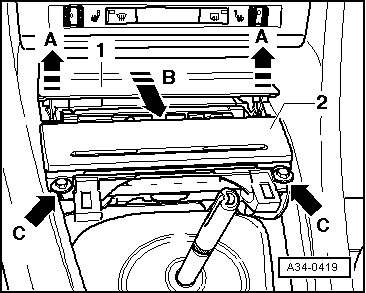 – Unscrew bolts -arrows C- and then pull ashtray -2- out of centre console. – Unplug electrical connector for ashtray light. – Remove foam wedges from centre console. – Lift out the noise insulation. – Unscrew noise insulation for selector housing -arrows-. – Measure distance -a- between the two studs in the selector mechanism. l Specification: distance -a- = 85 mm. Measure from centre of one stud to centre of the other. – Loosen bolt -arrow- for push rod. l Rear push rod (in selector mechanism) should move freely in both directions on slide. – Set to distance -a- by moving rear push rod (in selector mechanism). – Tighten bolt for push rod -arrow- to 23 Nm. – Loosen bolt for selector rod -arrow-. l Connection between selector rod and selector mechanism should move freely. 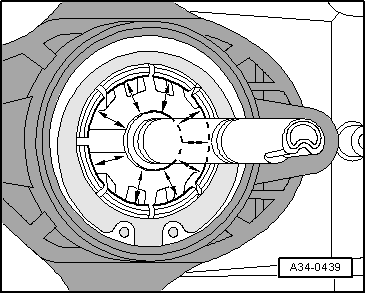 – Centre the bottom of the gear lever in the centre of the ball guide. l Distance between ball guide and bottom of gear lever -arrows- must be the same at all points. 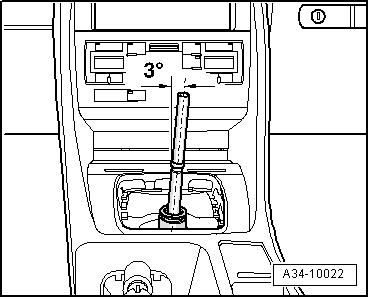 – Align gear lever so that it points slightly (3°) to the right (as seen in direction of travel). – Hold gear lever in this position. – Tighten bolt for selector rod -arrow- to 23 Nm. 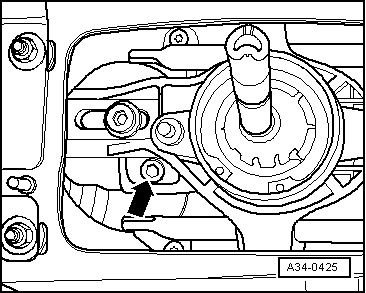 The gear lever must remain in the same position while the bolt is being tightened. l The gear lever should rest in the 3rd/4th gear gate when the gearbox is in neutral. – Select all gears several times. – Check operation of reverse gear lock. 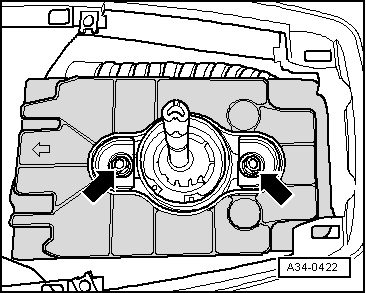 l The gear lever should return by itself from the reverse gear gate to the 3rd / 4th gear gate. 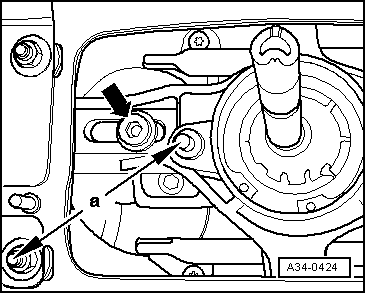 If the gear lever sticks or baulks repeatedly when engaging a gear, perform the adjustment procedure again. – Install trim parts and gear knob. Jury is still out on the MAF - I though it had worked as it seemed much smoother this morning on my commute, however about 50 miles in on cruise control at 70 the car suddenly started to pulse a bit, but it was pretty much at my exit junction, so I wasnt sure if it was a cruise control oddity or something more sinister, but it did seem that at the lights through town to work, the engine had gone back to being a bit lumpy on tickover. My old one was pretty sooty i noticed, but did it quickly last night. Presume they dont need recoding or anything as I dont have any ECU faults. 2002 2.0FSI A4 Avant...Lumpy/low idle RPM sometimes hard to start. WHY? Question Lumpy idle/slight missfire/lack of power.